For 125 years, the Field Museum has brought stories and collections of natural history to life. Starting from the World’s Columbian Exposition to its current home near Grant Park, this Chicago-based institution has displayed mummies, dinosaurs, Native American objects and so much more. To help celebrate this milestone, their latest exhibit involves one of the Museum’s original curators, Carl Akeley. Akeley joined the Museum in 1896, where he became the chief taxidermist. He made a total of five expeditions to Africa during his time there, including one where him and his wife, Delia, took down two African Bull Elephants - also known as “The Fighting African Elephants” seen in the Museum’s main hall today. In addition to his background in taxidermy, Akeley was also a successful inventor, with more than 30 patents to his name. One of his major patents, the Akeley Motion Picture Camera, was invented in 1915. The exhibition took about four months to create and features a pristine example of one of his original cameras, which was portable, rotatable and easy to maneuver. The camera was not only used during Akeley’s exhibitions, but was used by military personnel during World War I. After the military gave up the exclusive rights, newsreel companies and Hollywood’s film industry used it for action sequences and aerial footage. Other objects in the exhibition include original video footage from 1928, a taxidermied sheep he created over 100 years ago and bronze sculptures. 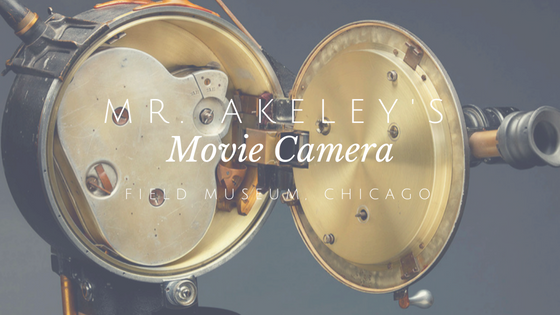 Mr. Akeley’s Movie Camera is free to the public with museum admission and can be found in the T. Kimball and Nancy N. Brooker Gallery until March 2019.